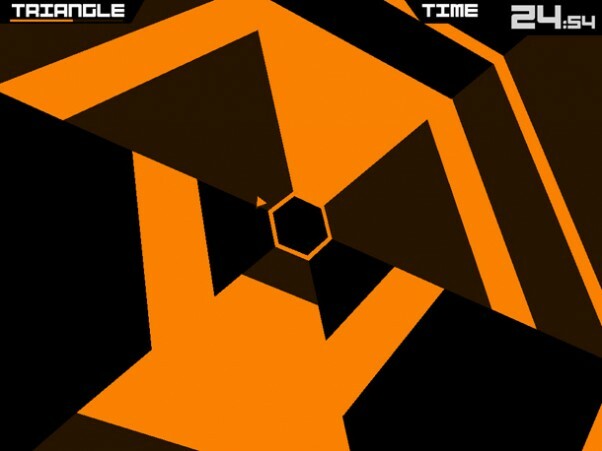 Super Hexagon is my current obsession. I wanted to review the game within half an hour of playing it, but thought that I should perhaps survive for longer than 8 seconds before doing so. Luckily, I went on a trip to Ireland recently which involved an 11-hour car/ferry journey so I had ample time to brush up on my skills. I now have a top score of 200:07, ranking me number 412 in the world! Enough about me though, I want to talk about this awesome game. The game involves controlling a small triangle that revolves around a transforming shape in the middle of the screen. Touching the corresponding side of the screen with your thumb rotates the triangle either clockwise or counter-clockwise. It takes time to get used to the controls because it turns very quickly. It has to, though, because while you do this all manner of geometric forms careen towards the shape in the middle and you have to use all of your twitch skills to avoid them! Survive for 10 seconds and a GLaDOS-like robotic voice says "Line!" indicating the next level. Then everything starts spinning faster, colours change, shapes shift and your eyes will begin to dry out, but you can't blink because otherwise you won't make it to the subsequent Triangle, Square, Pentagon and Hexagon levels. 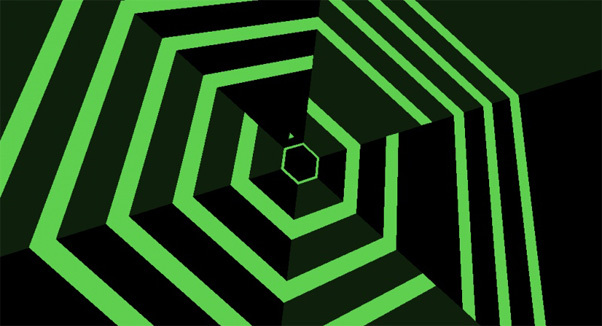 Hexagon is reached by surviving for 60 seconds and officially counts as completing the level, but really you'll want to chase high scores. There are three difficulties: Hard, Harder and Hardest. Beating each one unlocks three more: Hardester, Hardesterer and Hardestest. So yeah, it's hard, however what makes it so good is that the game hardly ever manages to be frustrating. The reason for this is that every game lasts such a short amount of time that replaying never feels like a chore. You're also constantly under pressure, which means there are no moments of boredom leading up to the level you were previously at. The other huge incentive for continued play comes from the amazing soundtrack by Chipzel which adds to the relentless assault on the senses and perfectly complements the neon-abstract visuals. Ah yes, the visuals. Terry Cavanagh has created one of the most aesthetically elegant yet aggressive games I have ever seen. These screenshots display a consistency of form and function coupled with energetic and sparse use of colour. In motion, the game displays these qualities, but shifts and contorts at such a breathtaking pace that it is impossible to take it all in. The most captivating aspect of the visuals in this game is how they directly tie into the game design. The more complicated and difficult it is to maneuver the shape of the section, the more interesting it is to look at. The amount of times I have died at the point of the above image is innumerable. It is a simple yet brilliant game, a masterpiece of arcade game design. Give it enough time and it will own you. The only small issue I have with the game is the occasional slowdown. Nothing dramatic, but it is there and to be honest can at some points be helpful. See you on the scoreboard!